I don’t know how fast whatever force that is swallowing up the city is moving. So I just start running, at first as fast as I can go, but I gradually lose energy until I’m just back to a walk. I keep going, though, until I reach the bus stop. I take the next bus that arrives that’s also headed for the opposite direction of the oncoming nothingness. It takes me to the central hub where I take a second bus going straight for the original library branch. I carefully look around. Ever since the librarian suggested that I have some intuition about when and where things are disappearing, I’ve become paranoid. I need to keep my eyes open, pay extra attention, and take note of anything, anything out of the ordinary. Okay, so the numbers she recited to me obviously belong to the Dewey Decimal System. In fact, they seemed to be the very last ones possible, likely not going higher than a thousand. After taking a few mental photos of my surroundings, so I can cross-reference them with what I see later, I enter the stacks, and head for the last shelves. I find myself in a section labeled Extraterrestrial Worlds. Really? Aliens? I guess it could technically explain what’s going on here. It’s kind of the go-to explanation for phenomena that don’t make any sense. Aliens are too easy, because they can do anything. Their technology can be at whatever level suits the story. You don’t have to figure out how the antagonists somehow managed to turn garbage into edible food decades, or centuries, beyond the technological level of the rest of the world. You just have to decide how much smarter, or further in development, an alien race is. Was this it? Was this what she the mysterious librarian was trying to tell me? She didn’t tell me to look for a book, she just said to remember the numbers. If she wanted me to read a book itself, would she not have just given me the title? Perhaps, perhaps not. Perhaps she didn’t know. I run my fingers across the books, looking for the right number, even though I know it’ll be the very last one. I pull the book out. Hotspots: A Look into Places of Great Power on Earth, and Beyond. It sounds to have more to do with this planet, than any other, but again, the librarian didn’t mention anything about reading a book. Still, what if that’s exactly what she meant? I have to exhaust all my options during the investigation. I read the whole thing cover to cover, including the copyright page, which might have held the name of someone I should contact, or a code of some sort. I just don’t know what I’m looking for, so it’s all relevant, until proven otherwise. The book actually turns out to be a rather fascinating read, especially since I now know all this to be possible. The writers put forth a theory that there are many locations around the world, and in other worlds, where time doesn’t behave. They use the analogy of river, which is common to use when explaining time. In the river of time, water continually flows forward, but there are obstructions in it. Rocks, bends, branches hanging down; they can all distort the water’s motion. These things create, sometimes permanently, a spot where the water has to find a way around, above, or under. It still keeps going, it has to, but it’s still a change. Now the important part is that, once the water moves past any given barrier, it comes back together, and continues flowing normally. It is only that spot that holds any significance. A river is easy, as these impediments are obvious, even if they’re not immediately visible. Temporal hotspots, on the other hand, are a bit harder to explain. Why they exist is not something the writers claim to understand, instead assuming them to be as natural physical phenomena as rainbows, or wind. They list all of the hotspots they knew about at the time of publishing, including Stonehenge (of course), Ayers Rock in Australia, and Easter Island. They speak a great deal on Kansas, claiming that the borders were drawn in order to protect the entirety of it. This theory has some holes in it when you consider that parts of Kansas City, Missouri apparently belong to the same category as all of it, but they just attribute this to political complications. The most interesting part of the book is the section on Springfield, Kansas. It talks about its connection to another world; one that is dark, unnamed, and void of all healthy life. Words, sentences, and even entire paragraphs in this section are completely blank. There is clearly meant to be text, but it’s been erased, likely by time itself. This much I understand, so it can’t be what the librarian wanted me to see. After I finish reading it all the way through, I start flipping back through it, needing refreshers on some of the information. Besides this dark world we’re supposedly connected to, there’s also a planet that’s eerily similar to our own, but located in a galaxy nearly three million lightyears away. It also talks about Atlantis; how it’s located both on Earth, but also not. They consider it to be their greatest challenge, and hope to publish a second book, one dedicated exclusively to the mystery of Atlantis. Whether they end up doing this is anyone’s guess. This first one was released in...holy crap. How did I not see this before? I thought I read every word, but I somehow missed this. The book hasn’t even been published yet. It’s listed as being from 2017. How does a book travel seventeen years in the past? And why? And why here? This was all very helpful, assuming any fraction of it is true, or rather at least will be true. Though I know that something is going in, I don’t know that these writers understand the reality more than I already do. I still have to continue looking for answers, and trying to find out how far the librarian wanted me to go. I pull a few of the other books off the shelf, and feel around. I’m searching for a note, or a safe deposit box key, or something else. There’s nothing there, so after taking stock of my surroundings to make sure they haven’t changed since I arrived, I decide to look into the catalog cards. I do the same here, in the drawer that would have led me to the Hotspots book, hoping to retrieve anything that can point me in the right direction. What I end up finding is something I don’t understand at first. In the back of the drawer is a hole, and there’s something sticking out from it. At first, I pull my hand back. I’m not a huge fan of spiders or snakes, so sticking my hand in dark spaces is never something I would do otherwise. I put on a brave face, though, and reach back into it. A young boy stops flipping through his own drawer to look at me funny. “I think I lost my watch in here,” I lie. He nods, then just leaves. As I’m feeling the metal protrusion, I realize what it is. It’s a door with its knob removed, so all the guts and moving parts can be accessed. Back when I was searching for Escher Bradley, I ended up finding a doorknob in the invisible house that he disappeared from. This is it. How the librarian knew that I had this knob I don’t know. I’m just glad that I keep it with me at all times, rather than in my car, which no longer exists. I look around again, not checking my environment for changes, but just to see if anyone’s watching me. I don’t know what happens when I install this knob, but it’s best to keep it from public view. The knob snaps onto the catalog door like a magnet, no screwdriver required. I look around one last time, then turn the knob. Either the entire catalog and I flip over a hundred eighty degrees, or the world itself does. It certainly feels like I’m standing on my head, even though my feet are still firmly planted on the ground. I soon learn that I am the one who moved when I notice where I am. It’s a cave corridor. Water is dripping upwards from a stalactite next to me. As soon as I remove the knob from its place, I fall down to the cave floor, slowly and safely. As extraordinary as what just happened was, now it’s done. Now I’m just standing in a wet cave, with no apparent place to go from here. It’s about half the size of a gymnasium, but I don’t see any corridors. But then a light begins to shine from a pool of water. I squint and approach it carefully. 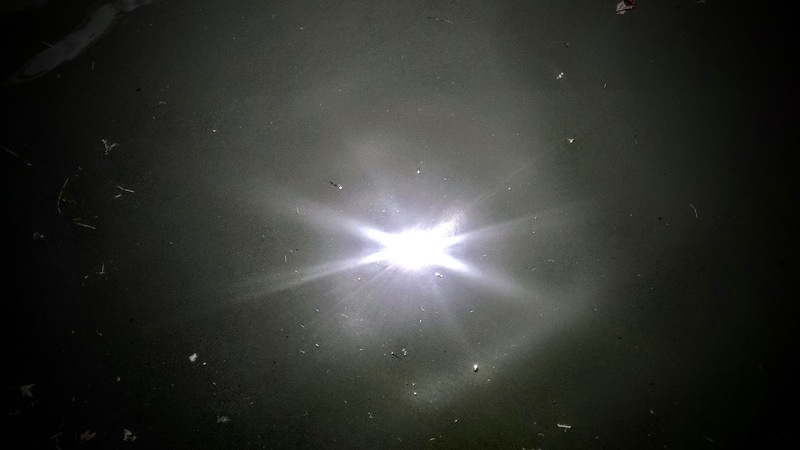 I think maybe it’s a magical alien tractor beam, but when I reach into the water, I discover that it’s just a flashlight. I pick it up to look for a way out, but something else catches my eye. I shine the light on the cave wall, trying to reflect it as much as possible so I can read the label on the bottom. RL. This is Rothko’s flashlight.